A series of large-scale kinetic sculptures bring a contemporary twist to the lives of the saints … Landy’s large-scale sculptures consist of fragments of National Gallery paintings cast in three dimensions and assembled with one of his artistic hallmarks – refuse. He has scoured car boot sales and flea markets accumulating old machinery, cogs and wheels to construct the works. Visitors can crank the works into life with a foot pedal mechanism. The sculptures that dominate the show (the 2D works are fun, but seem like backdrops) are all rickety 60s/70s style junk machines, given fiberglass shells based on pieces of images of saints from within the National Gallery’s collection. To an art historian, they will all be obliquely familiar, rather than quite recognizable, perhaps because the source works turn out not to be the Big Works, but less well known ones that are in the NG collection. 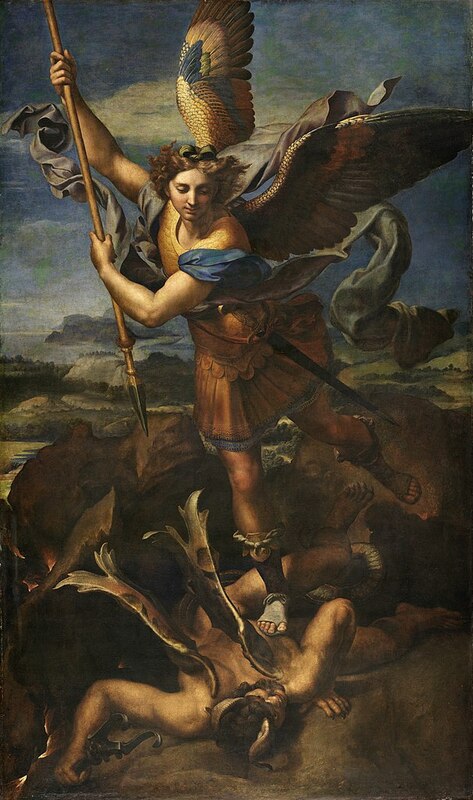 The image of Michael trampling Satan, for example, made me at first think (gasp!) of Raphael (who painted two versions, here and here), but is in fact based on Carlo Crivelli’s painting of some decades earlier. Perhaps the most effective — the most affective, the one that generated in me the most emotional response — is one of Saint Jerome, beating himself with a rock. Good photos of this, and others, are here at the Guardian. This is drawn not from Albrecht Dürer’s well known work at the National Gallery, but on Giovanni Battista Cima da Conegliano’s roughly contemporary and somewhat similar image. Landy beheads him (and disarms him partially, as well). He appears as headless torso, with the arm holding out the rock. Just out of the frame in the Guardian’s image, there is an old-fashioned foot pedal in a steel case, like the one you used in high school shop class to get the lathe up and running. The button worked — the saint sprang to life, as it were, and beat his breast noisomely with his rock. There was a lot of noise, and the guard stationed nearby was wearing the sorts of ‘earmuffs’ that constructions workers wear. Another, on the far side of the room, had more discrete earplugs in place. The beating lasted a few seconds, and then Jerome lapsed into stillness again. If there is a point of interest, here, it is not that Landy brings these old, dead religious works to life anew, to make something lively and animated. They aren’t, really. Instead, they are a bit grim, creaky and, half-broken, somewhat depressing. There is, though, one element that did give me a bit of a jolt — I have to press a button in order to drive Jerome to beat himself. The power of the work lies in the role of the “viewer,” who is here more than a “viewer.” The role of the actant. Of the instigator. Of the perpetrator. Medieval and Renaissance paintings are full of images of supposedly praiseworthy people doing substantial physical harm to themselves. Why do people hurt themselves? In the case of Cima’s painting of Jerome, to punish the body to purify the soul. In Landy’s work, it is because we make him do it. And, since the sculpture is so big, the violence the visitor causes is large-scale and dramatic. Like those psych experimentees of the 70s, we are asked to press the buzzer to deliver the abuse (something like being part of Milgram’s experiments). But we are abusing something clearly mechanical, a machine with exposed cogs and with emotionless, recreated shells partially draped atop them. The works are all gears and pulleys and fiberglass, and they capture none of the flesh and blood and vivid life of the originals — that is, of the paintings collaged over their mechanics, but also of the saints who served as the inspiration thereof. I was visiting with my good friend the Reverend Doctor Alun Ford. We’d tired of the clanging and banging, so we went around the bend, to a work I wanted to test out on Alun, and on the Landys: Hieronymous Bosch’s Christ Mocked. He’d seen it before, of course. I have spent hours in its presence. Landy didn’t choose this as a model for any of his works, and I suspect that is all for the best. It is a subtle thing, and there is little fun about it. 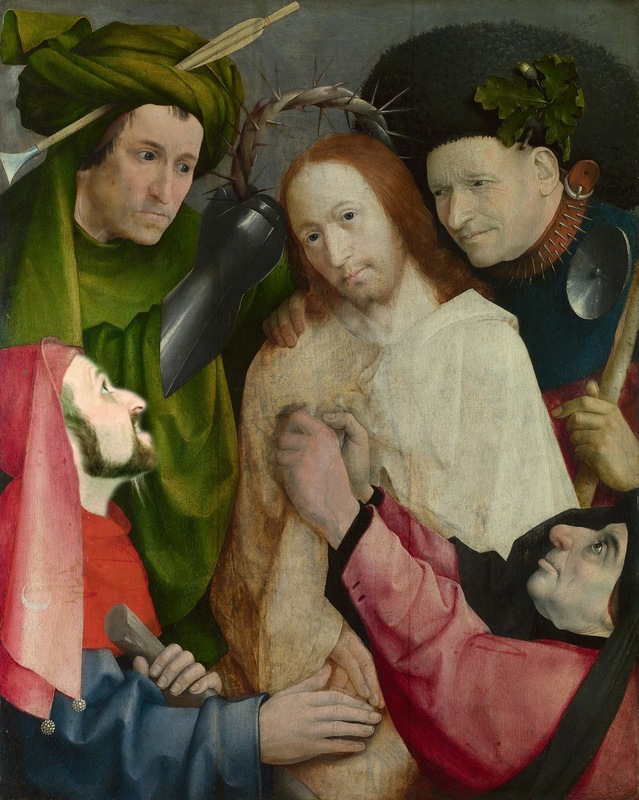 At a glance, it’s fine — Jesus, surrounded by four cruel mockers. It doesn’t move. Has no buttons or gears or pulleys. But the viewer is unquestionably implicated, all the same. Alun at first said that Jesus’ expression seemed full of pity and compassion. I thought that too, the first time I took a quick look. But stand there, awhile. The composition is tightly compressed, almost airless. The figures are pressed up against the picture plane, so that we are inches from them, and can’t really back away to a more comfortable distance. The tormentors are a vicious lot. The one to the lower left is the most problematic, since it seems to be a conflation of medieval caricatures of Jews and Muslims, a sort of condensation of religious-ethnic othering. He is shown in full profile to highlight the large hooked nose (in class, I can step between the projector and the screen and cause my shadow to fill his profile rather perfectly) and scraggly beard. His hood, though, has a crescent and star on it, implying that he is a Muslim, but it also has bells at its ends, suggesting he is a fool (perhaps in more than the professional sense). He carries a wooden staff, an attribute I’d not really thought through before, perhaps intended to suggest that he is traveling — a key plank of Christian fears about the spread of Jews and Muslims. His expression is fierce and maniacal. He seems to be breathing through his mouth, panting, his lower jaw thrust aggressively forward. His eyes blaze. And yet, his hand gesture is calm and gentle. He lays his hand limply atop Jesus’ hands. Why? What does it add up to? The rest of the tormentors are likewise a whirlwind of complex and competing emotions. The fleshy figure to the lower right is as heavy and well-fed as the Muslim-Jew is thin and ascetic. He seems poised between happiness and anger, and seems at once to be pulling Jesus’ robes tighter about him and beginning to tear them off. The figure in the dog collar, coming in close and placing a genial hand upon Jesus’ shoulder, is a wonderfully modulated presentation of transparently false sympathy. He looks like Michael Madsen (as Mr. Blond) in Reservoir Dogs, talking with the poor cop he is about to torture. And then, of course, there is Jesus, in the center. He looks straight out at us. Eye to eye. He is still and silent, and somewhat inscrutable. What is he communicating to us? The longer I stand before the painting, the colder his gaze seems to be. The more accusatory. A few years ago, I brought a small group of students to the National Gallery. They were not my best students — unmotivated and disinterested, apparently enrolled in a study abroad program as a way to get to English pubs. I was pretty steamed, and so I decided to try an experiment. I told them to just stand there, in front of this painting, until they felt something. They stood. At first, they fiddled about, looked around the room, shifted their feet, sighed dramatically. But after about 20 minutes, they settled down. After 25, they were very still. By thirty, two were staring silently at the image, crying. The third asked, very politely, if we might leave, as she felt like her skin was crawling. I agreed, and from that point, on, I no longer had to work to convince them that medieval art could be powerful, emotional, gripping, worth looking at. So, my point is this: animating excerpts of medieval and Renaissance works of art with gears and cogs, making them loud and jumpy, is not necessary to bring these works to life. Quite to the contrary, Landy’s added noise and motion turns them into cheap gimmicks, when, instead, we can find them overflowing with life if only we can still our ourselves. Dude, that photoshopped image of the Bosch is extremely disturbing! Why thank you! That is what I was going for.